We offer several types of healing services to residents of the Rihmond/Wilson Catchment area, e.g. Casino, Kyogle, Nimbin, Lismore, Ballina, Lennox Head, Woodburn, Tuckurimba and so on. The services we offer are described below: Each healing session involves a conversational part, where underlying causes may be discussed, and the hands-on healing part performed on a massage table. 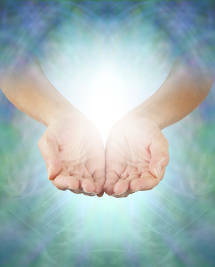 The hands-on healings operate on the spiritual body, also known as the etheric body. The etheric body permeates and surrounds the physical body. The hands-on healing sessions correct problems with the etheric body. The session durations given below are a guide only - if more time is required there is no extra charge, and no one leaves until they are free of negative energies. This traditional healing method cleanses and restores the etheric body, removing all foreign energies and repairing the gaps. A session lasts between 75 and 90 minutes and costs AUD $150. Lost souls and fragments of other peoples' energies can attach themselves as spirit attachments or entities to the body. The entities are crossed over to the spirit realm. In the eastern traditions, the chakras are important centres of energy on the body. These can get off centre and out of balance, and so this healing restores the chakras to their correct position and function. The Kundalini pathways and associated chakras are cleared and balanced, promoting access to the Kundalini energy. Once you've had any of the above healings, you may like to have an energy boost from time to time. This is a shorter session where your energies are balanced and boosted. A session lasts between 45 and 60 minutes and costs AUD $90. We provide spiritual healing services to the Richmond River and Wilson River catchment area, including Kyogle, Casino, Nimbin, Lismore, Ballina, Lennox Head, Alstonville, Woodburn, Tuckurimba and surrounding areas. Chakra balancing, spiritual and energy healing and spirit release services are performed by Aneta McCaughey and Paul McCaughey in Lismore Shire, Richmond River Shire and Ballina Shire. Ballina Spiritual Healer, Ballina Spiritual Healing, Ballina Energy Healer, Ballina Energy Healing, most powerful spiritual healing Ballina, most powerful energy healer Ballina Lismore Spiritual Healer, Lismore Spiritual Healing, Lismore Energy Healer, Lismore Energy Healing, most powerful spiritual healing Lismore, most powerful energy healer Lismore Kyogle Spiritual Healer, Kyogle Spiritual Healing, Kyogle Energy Healer, Kyogle Energy Healing, most powerful spiritual healing Kyogle, most powerful energy healer Kyogle Casino Spiritual Healer, Kyogle Spiritual Healing, Casino Energy Healer, Casino Energy Healing, most powerful spiritual healing Casino, most powerful energy healer Casino The post codes covered are 2469, 2470, 2471, 2472, 2473, 2474, 2475, 2476, 2477, 2478, 2480.